While we may all agree having clover in the pasture mix is good, occasionally they may need to be sacrificed for the greater good of the pasture! As our world becomes increasingly connected, weed pressures and populations continue to expand. The diversity of a typical mid-west pasture creates difficulties when it comes to dealing with weed populations. These pastures usually contain a mixture of grasses, legumes, and forbs, some of which are beneficial and some of which are weeds. Eliminating the weeds while preserving the beneficials is a challenge and sometimes a sacrifice needs to be made for the greater good of the pasture and in turn, your livestock. 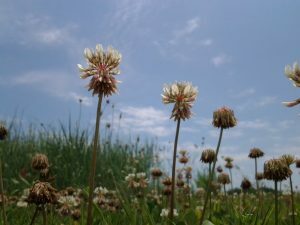 The list of weeds you may find in your pasture is nearly endless. Some of the most ominous weeds in Ohio pastures are Palmer amaranth, thistles, marestail, and coming soon to a pasture near you- spotted knapweed. Due to their ability to prolifically produce, these weeds become big problems fast. Graziers tend to use cultural or mechanical controls to address weeds first. Mowing can be effective if timed appropriately. Amending the soil is often essential. Chemical control is sometimes the last resort due to fear of harming the good grass or clovers. While no method will give you 100% weed control, your best chances are achieved with a combination of all three. Sometimes it is more economical to sacrifice your clovers than to preserve them. Those weeds mentioned earlier are bad news for pasture sustainability. A single female Palmer amaranth plant has the potential to produce half a million seeds. The herbicides that will kill Palmer amaranth, marestail, thistles, and spotted knapweed must be applied early in weed development and will probably cause significant harm to your legume stand. Timing is crucial for controlling aggressive weeds. For example, the best chance you have for treating Palmer amaranth is to act when it is three inches or shorter and this window narrows rapidly, because it can grow up to three inches a day. If mechanical control is employed, it must be accomplished before seed heads develop on the plant. Weeds rarely develop at the same rate or grow to the same heights. Some of the difficulties with mechanical control include setting the appropriate height for mowing, allocating time to clip pastures, and the cost of fuel to make multiple passes over the pasture. More frequent mowing will lead to greater success. As mentioned previously, no method alone will provide complete control. Even in low input systems, chemical controls may be economical and efficient tools. There are no broadleaf herbicides available right now that are safe for clovers. Dow AgroSciences has a herbicide currently in development that has shown promise for safe use on white clover, but it will likely be a few more years before it hits the market. If you realistically weigh the risks, you could be fighting a losing war with weeds for years hanging onto that clover stand. Or you could sacrifice the clovers, use a tested and recommended herbicide, and replace the clovers the following year. No-till drills are wonderful tools for planting clovers in the fall. Frost seeding is also relatively easy for clovers. 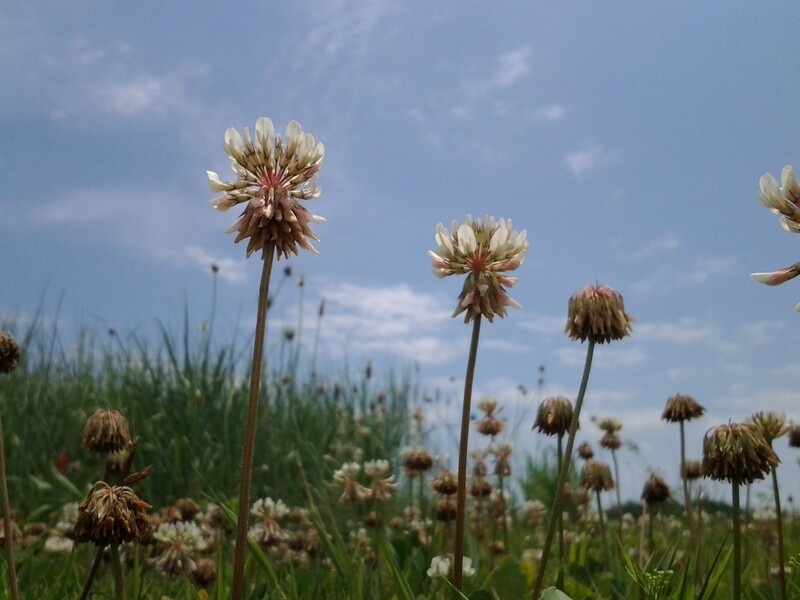 Dutch clover is the most commonly found clover in perennial pastures, but it’s value is often overestimated. Dutch clover is persistent and spreads easily. However, in comparison to improved clover varieties Dutch clover falls short in yield and quality. Replacing Dutch clover with improved varieties of white clover, such as Ladino clovers, can improve the value of the pasture sward. Introducing freshly inoculated seed can also improve nitrogen fixation in the pasture. If fertilizer is needed, it can be broadcast with clover. Avoid seeding clovers directly into freshly spread manure. Always follow the label when mixing and applying herbicides. Many weeds are resistant to commonly used products. Check the label before purchasing for the effectiveness rating on your problem weeds. Typically, the ratings indicate percentage of control. Look for products that will have 90% control or better. Also, be sure to use the appropriate rates. Under applying herbicides increases the development of resistant weeds. For more information about forage and herbicide selection, weed identification and control, and general pasture improvements, consult your local Extension office. A pasture walk with a professional can be the most effective tool for pasture improvement. Posted by Smith at 5:15am April 30, 2018 Posted in Pasture. Bookmark the permalink. ← Cutting Height in Hay Fields: How Low Can You Go?